ICAX has invented, developed and patented Interseasonal Heat Transfer™ and also uses solar thermal collection from pitched roofs. Solar Roofing provides an alternative means of collecting solar energy for Interseasonal Heat Transfer from pitched roofs: it allows solar energy to be collected efficiently and economically from south facing pitched roofs. A Solar Roof collects solar heat energy from the surface of pitched roofs for storage in ThermalBanks and use for space heating in winter. A Solar Roof provides the dual functions of providing waterproofing for pitched roofs and solar thermal collection. 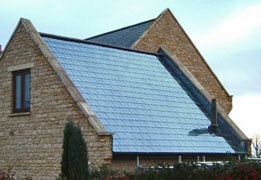 The design of Solar Roofing follows the ICAX philosophy of providing a second function to existing building fabric. In this case the second function of solar thermal collection has been added to the primary function of a pitched roof covering – to ensure a waterproof seal. Solar Roofing, like an Asphalt Solar Collector, is an efficient means of collecting a large amount of warmth to raise the temperature of a ThermalBank from the natural temperature of the ground up to over 25°C for use in Interseasonal Heat Transfer. Black roads – and black roofs – tend to absorb the heat of the sun up to the point when they radiate heat as quickly as they are absorbing it: the surface temperature of roads in direct sunshine can often reach 15°C higher than the ambient air temperature. ICAX collects heat using fluid circulating through an array of pipes embedded in the surface of the road and deposits it in ThermalBanks constructed beneath the insulated foundation of buildings. The temperature across a large ThermalBank can be increased from its natural temperature of 10°C to over 25°C in the course of the summer months. ICAX gives a second function (heat collection) to standard building fabric (roads, school playgrounds or roofs) that will need to be built in any event. The marginal extra cost of adding solar collection to a planned road – or roof – is much less than the cost of buying dedicated solar thermal panels. There is no visual impact. ICAX places a ThermalBank beneath the foundation of a new building. This gives a second function (heat storage) to standard building fabric (the insulated foundation of a new building). There is no visual impact. ICAX uses a heat pump to recover warmth from the ThermalBank in winter and deliver heat via underfloor heating into buildings to provide heat without burning fossil fuels. There is no visual impact, no noise and no emissions of carbon dioxide on site. TRL reports on the successful trial of Asphalt Solar Collectors and Solar Road Systems for the Highways Agency in Toddington Results.